If you enjoy Lebanese food, then don’t miss the Beirut Resto-Cafe! This is an absolute gem of a find along the riverfront’s many restaurants. The prices are inexpensive, with pitta wraps starting at $3 rising to a maximum of $15 for the farrouj meshwi (a 1.2 kg boneless barbecued whole chicken for two, marinated in the chef’s special sauce). The menu is varied with the usual Middle Eastern favourites. The Beirut is run by Chef Mohammad (Mike) Abbouchi from Lebanon, with Dorka Molnar from Hungary leading up the front of house. Chef Mike is very hands-on in explaining the food to customers and keeping an eye out to make sure everyone is happy. It’s a very pleasant place to be and you feel comfortable and well looked after. I couldn’t praise this couple highly enough for the way they run the place. The restaurant consists of an outside seating area, but the inside is open and the seats looked comfier so we chose to eat in (smoking is allowed). It’s clean and modern and rather upmarket for what we’d expected to be not much more than a cafe. There is also a comfortable lounge upstairs which would be particularly suitable for groups and parties. Downstairs inside, there is also a cold counter where you can buy snacks to take away. We like to have a variety of dishes to taste so we were pleased to see a choice of mixed mezze platters – classic, veggie, and royal. 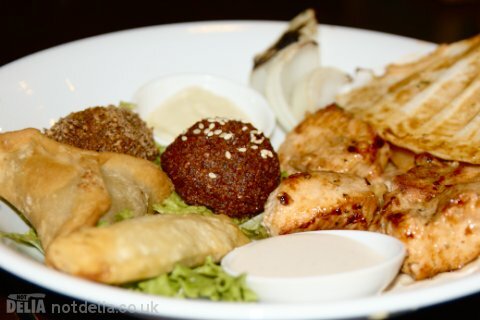 Each offers a selection of cold and warm mezze. We chose to share a royal mezze platter, priced at $14. Three of the cold mezze were old friends – hummus, babaghanoush and tabbouleh, all of which we regularly order whenever we eat Lebanese food. But the fourth, moujadara, was new to us. It’s a creamed mixture of lentils, rice, cumin and caramelised onions, and was very tasty indeed. Definitely a name to remember! The warm mezze consisted of a falafel, a kibbeh ball (minced beef with crushed wheat, pine nuts and pomegranate molasses), a kelege (triangle of grilled Lebanese bread filled with feta, tomato, mint and oregano), a meat sambousik (rather like a meat samosa, with minced beef, onion and Lebanese spices) and a rikakat (puff pastry with feta and parsley). And we were also offered the choice of a shishtaouk or a kofta. We chose the shishtaouk, a skewer of juicy chicken cubes. And the whole thing was served with an ample supply of Lebanese bread. The food was truly excellent. We scoffed it all up and left clean plates. Is there nothing to criticise about it at all? Only one small thing, which I mentioned to Chef Mike. It’s a wee bit hard to find the Beirut even if you know where it is on the map. The “Beirut” sign is somewhat obscured by the multitude of other signage on that busy stretch of the quay. But if you look out for a big sign saying “Shwarma Kebabs”, you’ve come to the right place. In summary, a very comfortable environment run by pleasant, talented people, delicious, with inexpensive prices. What’s not to like? I’m looking forward to going back to the Beirut again, and if you’re in the area I highly recommend you give it a try. We ordered two wraps from their takeaway service the following day: one lamb wrap with parsley, hummus, mint and pickles, and one falafel wrap with lettuce, tomatoes, pickles, mint and sesame cream. Sadly, we weren’t terribly impressed with either of them – the lamb was fairly tough, and the falafel wrap only contained one falafel. The lettuce and tomatoes weren’t up to much either. That said, we went for a sit-down meal again the day after that and were just as well fed as on the previous occasion. We’re not sure what went wrong with the wraps. Maybe they don’t travel well (although they only had to go two minutes’ walk down the road). On the other hand Mr ND reports that Chef Mike wasn’t around at the time, so it could conceivably have been a breakdown in quality control – he was certainly very hands-on when we went the first time.